The season-long quest to find Ford’s biggest NASCAR fan will continue with a new element this weekend at New Hampshire Motor Speedway. Ford will recognize Constantine Sealing Service of Glastonbury, Connecticut, as the Official Small Business of the Ford Hall of Fans. The company will have its name splashed across the hood of the No. 6 Fusion and driver Matt Kenseth’s uniform for Sunday’s Foxwoods Resort Casino 301. Constantine Sealing Service was started in 1979 by then-18-year-old Bill Constantine Jr., and has grown steadily ever since. He and his three sons now head an operation that includes a variety of commercial and residential pavement maintenance services in Connecticut and surrounding states, including paving, asphalt repairs, line striping, and seal coating. The family owns approximately 20 Ford vehicles of all shapes and sizes for both personal and professional use. 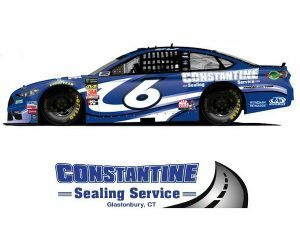 Constantine counts Ford drivers Kevin Harvick, Kurt Busch, Joey Logano, Brad Keselowski and Kenseth among his current favorites, and recalls rooting for the likes of Cale Yarborough, Davey Allison, Ernie Irvan, Bill Elliott, Rusty Wallace and Mark Martin through the years. Ford Hall of Fans launched earlier this year in an effort to recognize the people who make the sport tick – the fans. People can nominate themselves by submitting a video or photo that showcases their passion for NASCAR. Entries will be accepted through Aug. 19, 2018. A panel of judges will decide on 16 semifinalists. The public will be invited to cast a vote for their favorite, and six finalists will be selected to attend Ford Championship Weekend at Homestead-Miami Speedway Nov. 16-18, 2018. Two grand prize winners will emerge after a series of competitions. Each will receive a VIP trip to the NASCAR Hall of Fame Induction Ceremony in Charlotte, North Carolina, and a new Ford vehicle of their choice.